In general, the goal of patients who schedule eye exams is to obtain a prescription for eyeglasses, contact lenses or both. Others seek to maintain healthy vision and head off eye problems before they start. Standard eye exams involve a series of tests that use professional equipment to measure visual acuity and eye health, as well as diagnose common eye disorders. 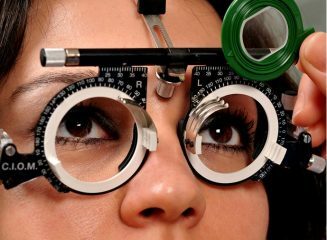 However, there are certain conditions that a regular eye exam does not test for, such as binocular vision dysfunction or double vision. Symptoms of double vision can indicate a greater problem, but most eye care professionals do not know what to look for. Binocular vision dysfunction (BVD) can cause extreme discomfort if not treated properly. BVD is caused by a misalignment of the eyes, which can lead those who suffer from it to experience symptoms such as headaches and dizziness, motion sickness, anxiety and sensitivity to light. With binocular vision dysfunction, reading becomes difficult as words appear to blend together and swim on the page. Double vision symptoms may also occur, resulting in deep frustration and even a fear of being in public spaces for the person suffering from BVD. To make matters worse, these symptoms are frequently misdiagnosed as migraine disorders, vertigo or sinus headaches. The frequency, intensity and type of symptoms vary from person to person, and can be triggered by sudden movements such as standing up too quickly, driving fast around curves or even just riding in the passenger seat of a car. If you’re experiencing any of these symptoms, a neurovisual exam is necessary to properly check your eyes for any small misalignments. During a comprehensive neurovisual exam, a neurovisual specialist looks for the slight eye misalignments that are typically missed during a regular eye exam. This type of exam is extremely thorough, and can take two to three hours to complete. Specialized aligning prismatic lenses are used to correct these misalignments, resulting in a reduction or, in some cases, an elimination of symptoms. At the Neuro Visual Center of New York, we provide comprehensive neurovisual exams for our patients, with additional office visits to adjust prescriptions. Our physicians, Dr. Cheryl Israeloff and Dr. Marissa Zimmerman, have been specially trained in the field of Neuro Visual Optometry and will conduct a series of extensive tests to check for any misalignments. To schedule your appointment at the Neuro Visual Center of New York, give us a call today at (516) 224-4888. Hi – I would like to be examined, but live in Dallas, TX. Can you refer someone in my area or do I need to come see you? I have many of the symptoms you describe for BVD. Thank you for your help. There are a couple of doctors in Texas that can evaluate you. Please visit the Vision Specialists of Michigan website there is a list of doctors and a map to find the closest to you.